Bowser, king of the Koopa, has taken over the Mushroom Kingdom and kidnapped Princess Peach using his dark magic. Mario and Luigi set out to rescue Peach so she can restore peace to the Mushroom Kingdom. Mario must advance through each stage within the time limit, defeating enemies, jumping over bottomless pits and hitting blocks to collect items. There are eight worlds each with four stages to travel through, many filled with secrets and bonus areas for you to discover. Super Mario Bros. was the biggest selling videogame until 2009, and was packed-in with nearly every Nintendo Entertainment System. Arcade VS. Super Mario Bros.
NES All Night Nippon Super Mario Bros. The heroic plumber has come to the Mushroom Kingdom to rescue Princess Peach. He can jump extremely high and can power-up with Super Mushrooms, Fire Flowers and Starmen to defeat Bowser's army. In the 2-Player game, the second player takes control of Luigi in the white and green. He has all the same abilities as Mario. A race of mushroom people and friendly servants to Princess Peach. They have also been captured by Bowser and are being held by Bowser in seven of his castles. The princess of the Mushroom Kingdom is the only one who can undo Bowser's spell on her kingdom, but she is being held in Bowser's castle in World 8. A little mushroom who betrayed the Mushroom Kingdom. Goombas are the weakest members of Bowser's army, walking blindly in one direction, even off platforms. Jump on its head or hit it with fireballs to defeat it. The basic troops in the Koopa turtle tribe. Stomp on a Koopa Troopa and it will hide in its shell, which can then be kicked to knock down enemies in its path. The Green Koopas walk off ledges, while red Koopas stay on a single platform. A Koopa Troopa with wings. Green Paratroopas hop around on the ground, while red Paratroopas hover back and forth in a particular area. Jump on a Paratroopa's back and it will lose its wings, becoming a regular Koopa Troopa. Despite its name, Buzzy Beetle is a little turtle with a very hard shell. It is invulnerable to Mario's fireballs, but if you jump on it you can kick its shell like a Koopa Troopa. A member of the Koopa tribe who controls the clouds. He flies back and forth dropping Spiny's Eggs from above. He is difficult to reach, but if you can climb high enough, a fireball or jump will take out Lakitu. Lakitu throws Spiny's Eggs at the ground where they hatch into Spiny. Spiny has huge spikes on its back, making them impossible to jump on. Mario can hit them with fireballs to defeat them. Elite members of the Koopa tribe. Hammer Bros. usually appear in pairs, jumping around and throwing an endless supply of hammers. Mario must time his movements carefully to hit them off the blocks they stand on or stomp on their heads - or he can simply hit them with a single fireball. A ferocious, man-eating plant that lives in the pipes of the Mushroom Kingdom. It moves up and down, so Mario has to time his movements to get past. If Mario is stood next to or on top of a pipe then the Piranha Plant will stay inside. A white squid that attacks Mario underwater. It bobs up and down, chasing Mario when he comes close. Blooper is unable to touch the ground, so Mario can wait on the seabed until the time is right to make a move. Hit it with a fireball to defeat it. Winged fish that swim slowly across the underwater stages. Red Cheep Cheeps are a little faster then green ones and both can only be defeated with fireballs. Red Cheep Cheeps also appear in ground stages, where they leap through the air in an arc. Out of the water, Mario can jump on Cheep Cheep to defeat it. A bullet with arms and eyes that is usually fired from a Bill Blaster. It moves in a straight line across the screen, passing through any objects in its path. It is impervious to fireballs, but Mario can jump on it to defeat it. A rotating stick of fireballs that appears in the castle stages. They come in two sizes and can move clockwise or anticlockwise. They cannot be stopped or defeated, so Mario has to time his movements to get past them. A fiery bubble that leaps out of the lava pits in the castle stages. Podoboo is invulnerable to all attacks, so Mario has to time his movements carefully when jumping over lava to get past them unscathed. The king of the Koopa turtle tribe has imprisoned Peach and can be found at the end of each castle stage. Each time you meet him he becomes more difficult. He starts by jumping around spitting fire, but then he surrounds himself with obstacles and starts throwing hammers. Either hit Bowser with fireballs or sneak past and grab the axe to defeat him. Defeating Bowser with fireballs in Worlds 1-7 reveals his true form as a decoy. A little mushroom that appears from blocks and moves away to the right. If Mario grabs it, he becomes Super Mario, giving him the strength to break Brick Blocks. If Super Mario is hit by an enemy, he becomes regular Mario again. A glowing flower that appears from blocks when Mario has become Super Mario. Grab it to transform into Fire Mario, allowing him to shoot fireballs with the B Button. If Fire Mario is hit by an enemy, he becomes regular Mario again. A powerful star that appears from blocks. If Mario grabs it, he becomes temporarily invincible, avoiding enemy attacks and defeating enemies just by touching them. A secret green mushroom that awards Mario with a 1UP (extra life). They are very well hidden in secret blocks throughout the Mushroom Kingdom. Scattered all over the Mushroom Kingdom are Coins. If Mario collects 100, he will be awarded with an extra life. A common block in the Mushroom Kingdom. If Mario hits it, he will always get an item or a Coin. A standard block that appears all over the Mushroom Kingdom. 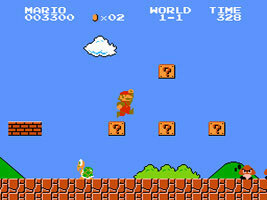 Super and Fire Mario can break Brick Blocks, although some may be hiding items or other surprises. Some pipes transport Mario to new areas, such as bonus rooms filled with Coins. Hidden in the game are several Warp Zones that let Mario skip to a later World. Hidden in certain blocks, the Vine will transport Mario to secret sky bonus areas filled with Coins. A springy platform that Mario can bounce on. If Mario times his jump right, he will get an extra boost, letting him jump even higher than usual..
An axe that sits on the bridge behind Bowser. If Mario can sneak past Bowser and grab it then the bridge crumbles and Bowser falls into the lava pit below.